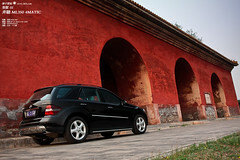 The 2012 Mercedes-Benz M-Class, a five-passenger luxury crossover, is significantly updated for the new model year. Despite adding more engine power, an upgraded interior, and a new front design, the model has the same starting MSRP as the 2011 version, which is $49,865. The M-Class will initially be offered with two different engines in the U.S. The gas powered 2012 Mercedes ML350 offers a new 3.5-liter direct injection V6 engine, which produces 302 horsepower and 273 pound-feet of torque. This is 34 horsepower more that the 2011 ML 350. The diesel powered ML350 BlueTEC is offered with a turbo-charged 3.0-liter V6 that produces 240 horsepower and a massive 455 pound-feet of torque. In comparison, the 2011 ML350 BlueTEC comes with a 3.0-liter V6 but had 210 horsepower and 400 pound-feet of torque. The diesel has a starting MSRP of $51,365, which is $2,500 more than the gas-powered version. The diesel is certainly a worthy additional charge if you want to save money on fuel costs. It returns 30% better fuel economy than a comparable gas engine. Both engines come standard with a 7-speed automatic transmission. All M-Class trims come standard with 4Matic all-wheel-drive. The M-Class enters its third generation in 2012. The luxury crossover model sits ¾” lower than the 2011 model and is nearly an inch longer and a half-inch wider. It offers a host of new features and is great for people who love gadgets. In addition to LED daytime running lights that are recessed in the front bumper, the M-Class has iPod docking stations built into the front headrests and 20” twin five-spoke allow wheels. The model’s interior trim includes Eucalyptus wood and aluminum elements. The optional 2 premium package offers ambient lighting in three different colors. The M-Class originally debuted in the U.S. as a 1998 model known as the ML320. Mercedes-Benz boasts the model began the industry trend towards car-like SUVs. It was also one of the first luxury SUVs offered. The 2012 M-Class is now on sale. it competes against such models as the BMW X5, Audi Q7, and Porsche Cayenne. The M-Class is built in Alabama. Which five-passenger luxury SUV model do you like best for $50,000?